Gardens in the Monaro area of southern NSW need to be resilient and tolerant of droughts, frosts and snow. Here is the story of three gardens. Garden 1, Shirley: Has been in Sally-Ann Cottle’s family since1929 and has been home to four generations of the family. GardenDrum: What is the background to Shirley and the area? 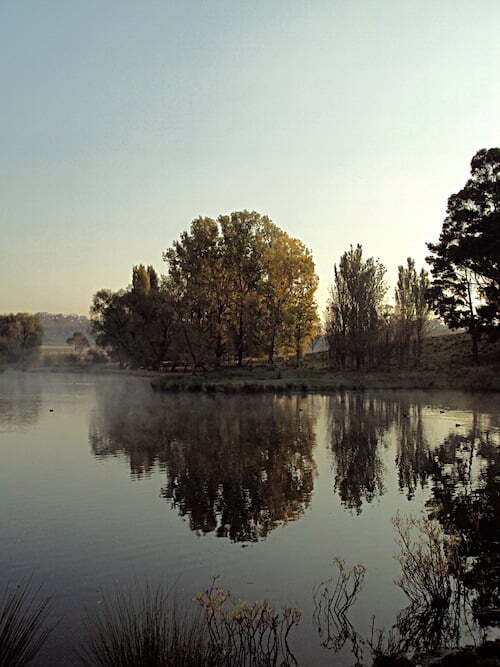 Located on the Monaro in southern New South Wales, the garden is 1000m above sea level. Plants need to be resilient in this part of the world. This means being tolerant of frosts and snow in winter, as well as able to withstand long periods of drought. The average rainfall is 32 inches per year. 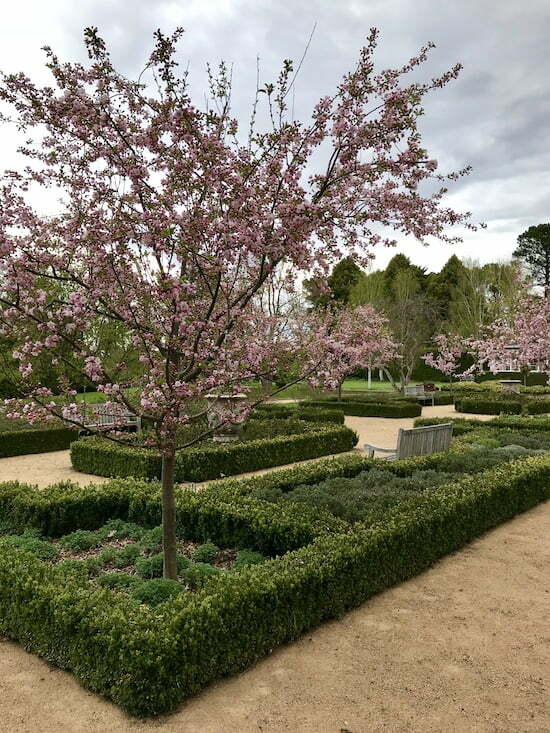 When we swapped the Melbourne city life for Monaro country in 1989, we knew we wanted to transform the seven acre garden. 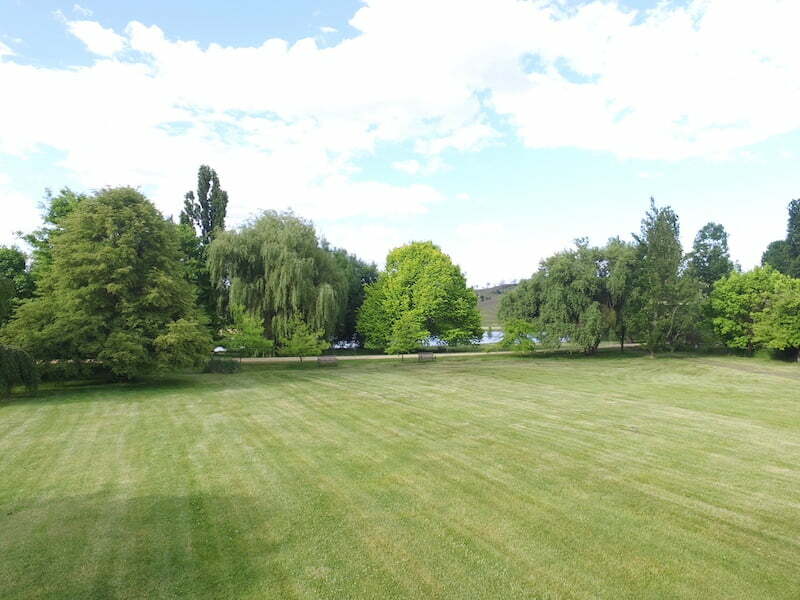 It was originally laid out in the late 1930s when Claude Crowe from Berrima drew up a master plan and supplied many of the trees and plants. In 2006 we asked Paul Bangay to help us with a new design to renovate the garden. GardenDrum: Describe what the garden is like? The Shirley garden is a very peaceful garden with large areas of parkland flowing down to a man-made lake. Closer to the house it has more formality with large lawn terraces, a French parterre in the place of the old tennis court and courtyards and water features. It is quite European in style. Trees are the main feature of the Shirley garden. We have many rare species of conifers, often not seen in Australia. The Malus floribunda and spectabulas are spectacular in spring creating a stunning blossom display close to the homestead. Aster daisies enmass in Autumn create an amazing display on the croquet lawn. Nepitia seems to thrive here and gives a stunning contrast to the almost entirely all green garden. GardenDrum: What do you love most? There are two parts of the garden that I love the most. The first is the parterre garden. Originally the tennis court, it has been transformed as part of Paul Bangay’s design. Designed to have an ongoing show, which starts in spring, until slumbering over winter. In spring we have magnificent blossoms of crabapples and white tulips followed by huge swathes of nepita. Summer moves into soft pink Duchess de Brabant roses and Lavandula angustifolia and in autumn the nepita returns. My second favourite part of the garden is the lake. Originally created as a water source, it’s now purely ornamental, and provides a focal point for the garden. 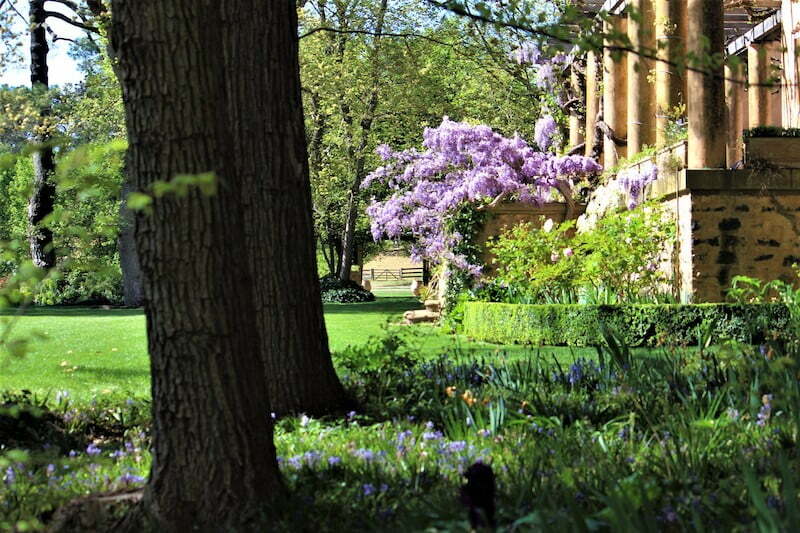 It creates a calm, tranquil environment and can be seen from most parts of the garden. The lake attracts bird life to create a world of its own. The garden for us is an escape from the harshness of life on the land. It has largely been about creating a beautiful environment in which to live. The garden is about beauty, the bird life and creativity. There is always something new evolving in our garden and it needs to withstand our harsh winters and dry summers… so resilience is key. 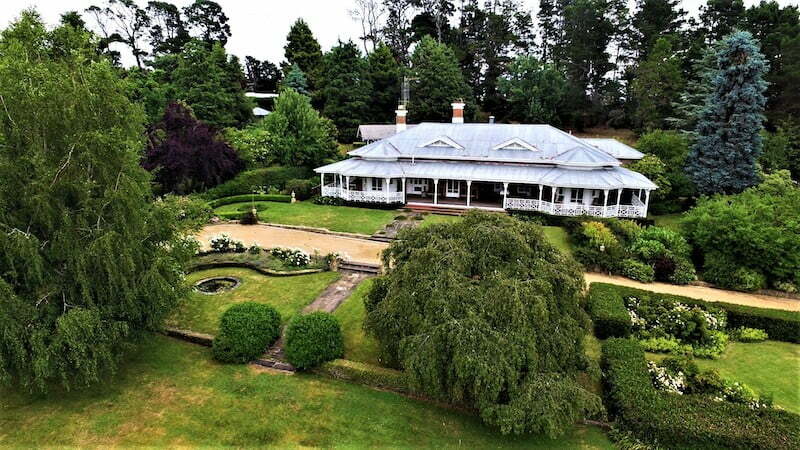 Garden 2, Hazeldean: Settled by the Litchfield Family in 1865 – it’s home to six generations of Litchfields, and to one of the largest and most progressive Merino and Angus Studs in Australia. GardenDrum: What is the garden like? The present homestead was built in 1907 and had a major renovation in the 1930s by Professor Leslie Wilkinson, the first Dean of Architecture at Sydney University. The house is surrounded by a forest of 100 year old English Elms, extending out to an English-like 10 acres of parkland. The 5 acre garden has recently been renovated by Jim and Libby Litchfield, establishing new stone walls and expansive lawn terraces. 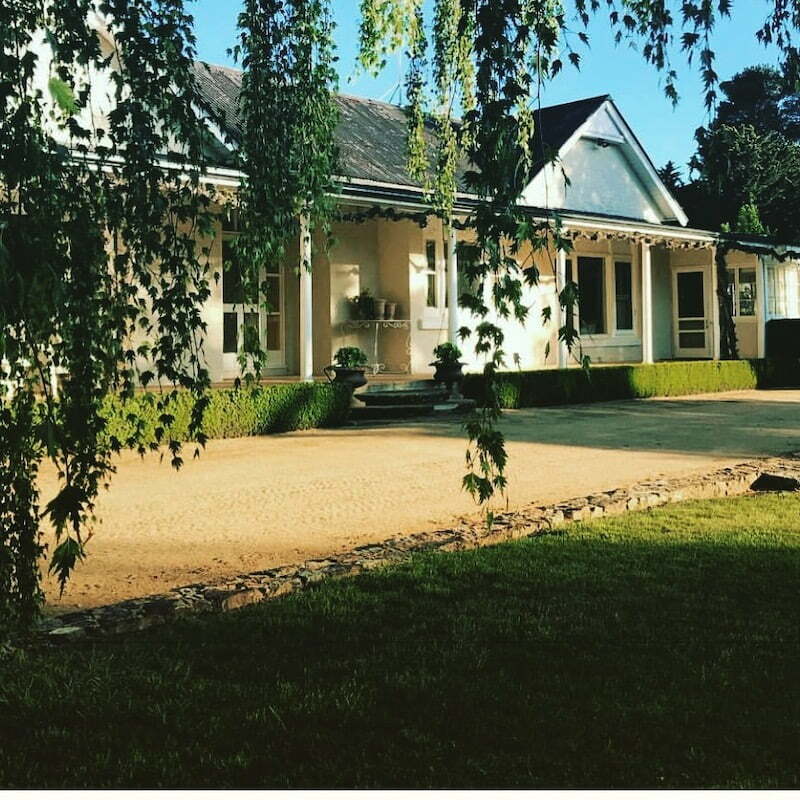 There are several courtyard gardens, a cross axis pear allee, extensive plantings of peonies, a wild garden of Spring flowering bulbs, a fruit tree orchard and fabulous vistas of the spectacular un-spoilt Monaro Plains, as well as historic stone stables built from basalt quarried from the property. Garden 3, Curry Flat: Thought to be named after the explorer Captain Currie, Curry Flat is a Merino sheep and Angus cattle property on basalt soil. GardenDrum: Describe the property? It was first settled by William Jardine from Dumfries Scotland in 1846. The original two-storey home is now occupied by our son Hamish and his family, the shearing shed and stock yards are also there. The present homestead was designed by well-known Monaro architect G.D Cochran in 1898 and rebuilt after a 1930 fire. Claude Crowe from Berrima Bridge Nurseries helped with the lay out of the garden and Alan Shepherd and Jack Upton from Bowral built the granite stone walls in l956. GardenDrum: What is in the garden? Old vegetable gardens, asphalt paths and pergolas gave way to a drive at the front of the house and a more formal approach was adopted. We have extended the garden to the north and south planting many conifers, evergreen and deciduous trees – many garden beds have been removed owing to the work load. Water for the garden is from a gravity fed spring and also a bore. The front of the house remains much the same as when Claude Crowe first designed it. As each of the children turned 21 we planted twenty-one trees eucalyptus, silver birch and juniper, and now have a fairy garden for the grandchildren. After cold, frosty and snowy winters, spring arrives with blossom trees, masses of tulips, daffodils, hyacinths and snowdrops. Next comes the peonies, roses and iris. Then there’s the summer perennials. Autumn is a lovely time with the beautiful coloured trees. Our son William designed the northerly aspect kitchen garden five years ago. Heat bank walls made of core filled bessa blocks were used and a timber frame supports the movable climbing screens clear plastic blinds for winter. A glass house was added last year to extend the growing season lime, lemon and grapefruit now abound. Last year we exchanged homes with William, Caroline and their young family. We maintain all the gardens and have recently planted many natives at our new home.